Lie detectors are fake; I’m not going to lie. There is no way to electronically determine if someone is telling the truth. Before attempting this project, we reconciled with the idea that it is impossible to electronically single out fibs and untruths. Nonetheless, as a final project for an Analog Circuit Design class at Stanford University, my partner, Jimmy, and myself concocted a full blown electronic polygraph machine. The class had a completely open-ended final project. We decided to see how many signals we could successfully draw and measure from the human body and combine into a single output. Lie detection is more of an art of intimidation than electronic sensing. Our aim was to build a collection of circuits which could detect several biological signals from a subject including pulse, respiration, hand tremors, and eye-movement. Each signal was represented visually either with LEDs, digital readouts, or hacked appliances. By summing and weighing all of the signals, we were able distinguish an arbitrary threshold as â€œlyingâ€. This aggregate signal switched on a red LED and turned on a small buzzer to indicate â€œlyingâ€. Without irregularities in the signals a green LED indicated â€œtruthâ€. Each circuit was calibrated to trigger on certain conditions that we found to be deviations from what a normal person would induce. The design was geared for more medical applications rather than expressly being a system of lie detection. Blood flow through a finger was sensed with two LEDs firmly attached on either side of a clothespin which was shielded from light with a paper towel roll. As blood flowed into the finger, the transmittance of light changed which changed the current of the receiving LED. This approach was surprisingly simple to implement and it is the same approach that hospitals use to monitor people. The key to this approach was to include a means of keeping the LEDs stationary. Breathing rate was something that we figured could be monitored rather well mechanically. A latex tube was filled with saline and capped by brass bullet casings; brass does not corrode in salt water. We couldn’t just let any old LED bar or display handle this particular measurement. We decided to make this a bit more flashy by hacking a blowdryer and coordinating the breathing to a PWM signal going into it. The result was the ability to float a ping pong ball that was completely coordinated electronically to the breathing of the individual. As the subjectâ€™s chest expanded, it changed the resistance across a voltage divider and turned off the blowdryer. Breathing out turned on the blowdryer and floated a ping pong ball up a clear polycarbonate tube. Blinking was sensed using an IR emitter and an IR photodiode, using reflection (blink) or transmission (eye open). We found a package that had both transmitter and received mounted together and was intended to work as a sensor. The package was mounted on some lab glasses and adjusted to point directly into one eye. The signal output slews from rail-to-rail when a blink is detected as seen in the figure where the high signal means transmission and the low signal is from reflection of the IR light. A simple CdS Cell in a voltage divider triggered hand movement. The cap was used to ignore oscillation. 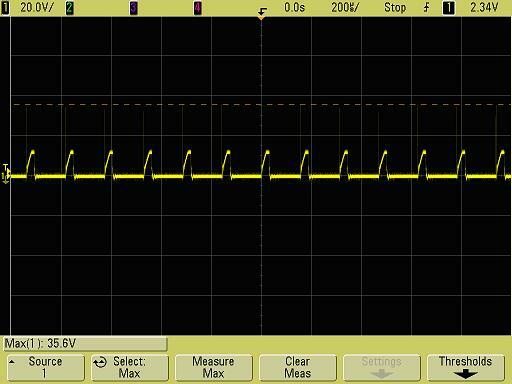 After a unity-gain buffer, this signal was fed directly into the decision circuit. It was critical to translate the low frequency values of pulse and respiration into comparable values of voltage. The low frequency resulted in large output ripple which we tried to minimize by putting a resistor and a capacitor at the output node in a one-pole low pass configuration to keep that node close an average value by taking advantage of the adjustable exponential decay to average out the rippling. These values we tweaked once we started summing all of the signals for a decision and deciding which signals would need to change constantly change (pulse and blink) and which needed to be more stable (respiration). See figures for output of pulse circuit at 50bpm, 90bpm, and 120bpm. All the signals were fed into the decision circuit which added up the voltages. The idea is that when someone is ‘lying’ their body would respond by increasing all of their signals like increasing heart-rate, making them breath faster, increased eye-movement, and hand tremors. That is the idea anyway. All these signals are combined together. If the sum of the voltages exceeded 7.66V (with 5.63V as the lower turn off), then the red LED would be illuminated and a buzzer would go off. Otherwise, the green LED would be on and the buzzer would be silent. We used a classic Schmitt trigger which worked perfectly. Even though circuits were thoughtfully considered, simulated, and extensively planned out, they still might not work when physically implemented. Additional stages needed to be added which amplified signals, severely filtered to counteract base-line drift, countered chip-specific limitations, dealt with unforeseen problems which only became evident as sensors were combined with circuits. Many of the additional components not present in our first design may be attributed to comments and help from TAs and Bob (Bob is an electrical engineer that would frequent our lab at Stanford. He worked for NASA and is retired). Many thanks to Bob for his suggestions to utilize a â€˜push-pullâ€™ circuit to counteract IRLZ34N limitations and other general debugging tidbits. We had a problem properly controlling the blowdryer motor due to high gate capacitance. Bob also helped with starting our digital counter clock by suggesting to use a one-shot to reset the count. Building sensors is as hard as building the circuits they interface to. It was impossible to determine what range of resistances we would need to deal with. It is hard to know what the resistance will be from a small bit of surgical tubing filled with saline and capped by brass bullet casings. These are all things that needed to be engineer as the circuits were being put together. Even when everything is â€œworkingâ€ human input itself is very temperamental and erratic. Details of the board design here. this is rohaan..m intersted to work on ths project..but got confused when read the post that Lie Detectors are FAKe..
so i jus want to confirm ,is it? and all lie detectors are fake,no matter how u made it..or only in ths ,what is given..? The principle that you can detect a lie based on galvanic skin response, voice inflection, muscle spasm, eye movement, heart rate, breathing rate, or any order of involuntary body response is inconclusive. These may be responses that correlate and *may* be related to lying, but not necessarily. The bottom-line is that you cannot detect a lie. However, this is not to say that Lie Detectors cannot be effectively used. In trained hands, they can be used to leverage answers to questions to aid interrogation–which may provide enough result to move forward in order to obtain concrete evidence or in criminal issues even confessions. in ToruÅ„ Poland. My profession is automatic and robotic. For long time i’m trying to build with my friends a professional lie detector. We make a lot of similar projects, but i need to say that your project is fully professionall. I would like to use your scheme and circuit to build something similar, or just make this one better. Is that problem to you? Is there any possibility to be in touch and try to build it together? The lie detector project was more of an exercise in analog circuit design. I posted it online to express a project for a class I took. If you are building something for recreation or for a class, by all means modify the design and learn some discrete analog skills in the process–it will still require lots of time to bring together. There are simpler schematics out there and this is by no means a perfect or complete design.